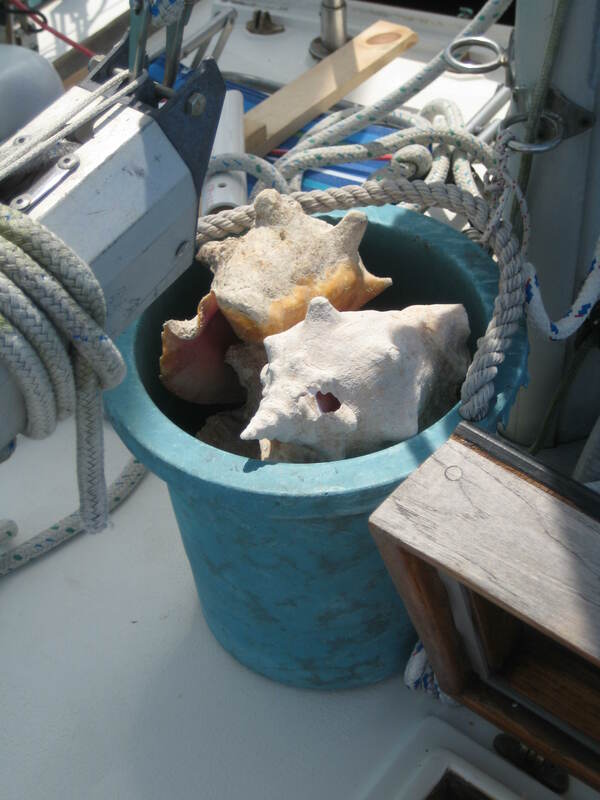 If you’ve ever cruised the Abacos, you probably have a similar collection of conch shells on board. Conch is a plentiful island treat that you don’t find in all places of the world. Markets in the islands are scarce, expensive and lightly provisioned so any opportunity to enjoy nature’s local bounty is welcome. Following is a recipe from our friend Anne who makes these frequently aboard Skookum. Keep in mind that conch meat is tough so you’ll need to pound it. Any hammer will work! Pound the conch meat to tenderize. Chop into small pieces. Mix flour, egg and milk. Add conch and vegetables. Frying on a rocking boat needs to be done very carefully. Best to use a deep pan, filled with only an inch or so of oil. And be sure your stove is swinging free on its gimbal. 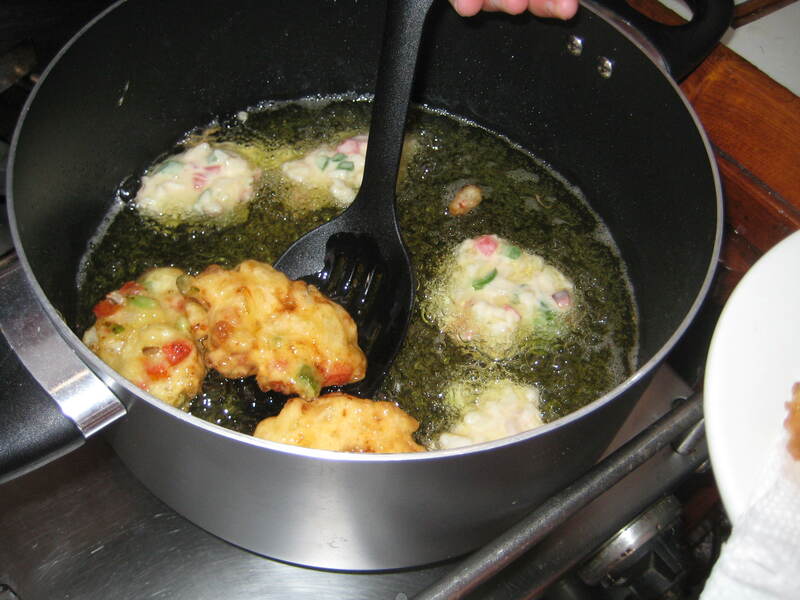 Drop spoonfuls of batter into the heated oil. 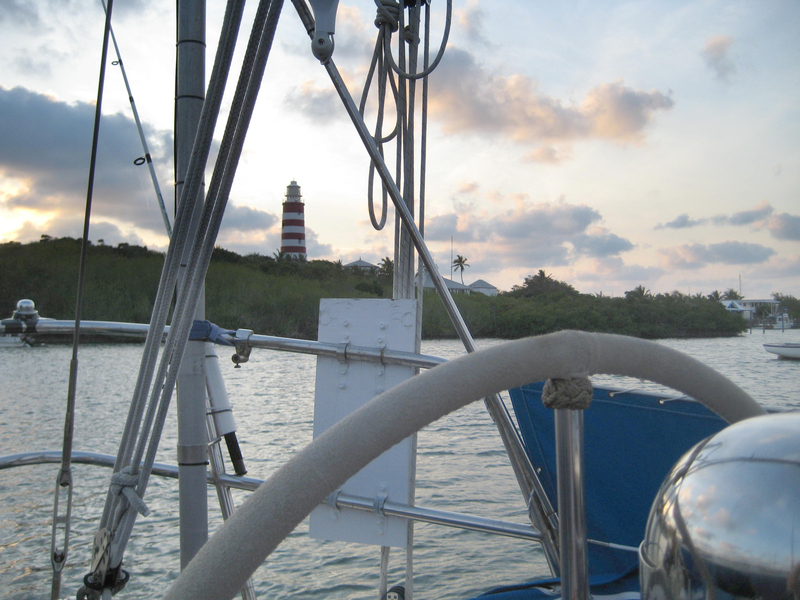 Best served at anchor with a cocktail, a sunset… and a Barefoot Man CD. Pound the conch meat to tenderize. Chop into small pieces. Mix flour, egg and milk. Add conch and vegetables. Drop spoonfuls of batter into the heated oil. Fry until golden. Remove with a slotted spoon and place on paper towel to absorb extra oil. Serve hot. Yum! Wish I had some conch fritters right now. Great tip I learned from my grandmother — put the conch in a quart-sized plastic freezer bag before pounding it. Makes much less of a mess that way. Great suggestion! Do you have a preferred “hammer” method? 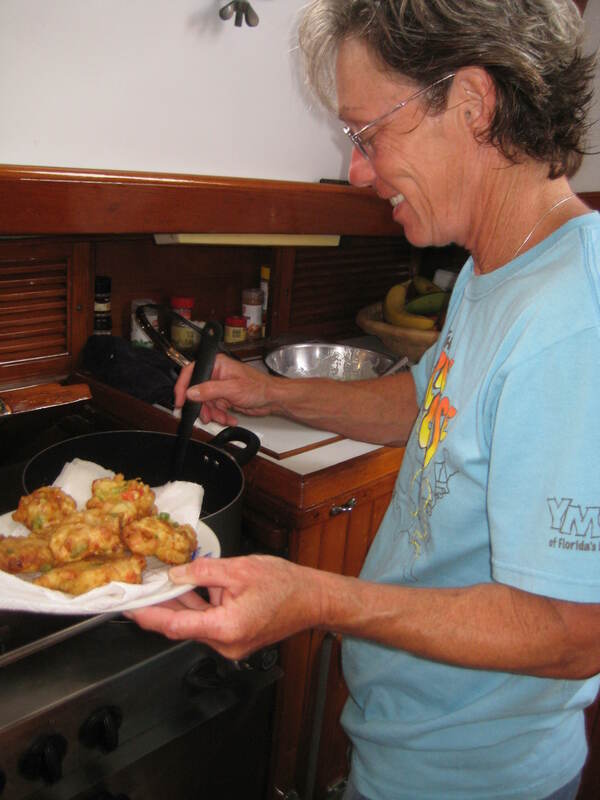 Do you have any favorite conch recipes you’d like to share? We’re always looking for good conch recipes! But one of my favorite ways I had it was grilled with a simple salt-pepper rub, you should try it! Ooo. That sounds good. I’ve never had it grilled. Next time I get my hands on some conch I’m going to try that. I’ll let you know how it turns out.